Team Leader at Dixons Carphone. Microsoft MVP. The source code can be found in GitHub here: https:/​/​github.​com/​PacktPublishing/​Hands-​On-​TypeScript-​for-​CSharp-​and-​. NET-​Core-​Developers. 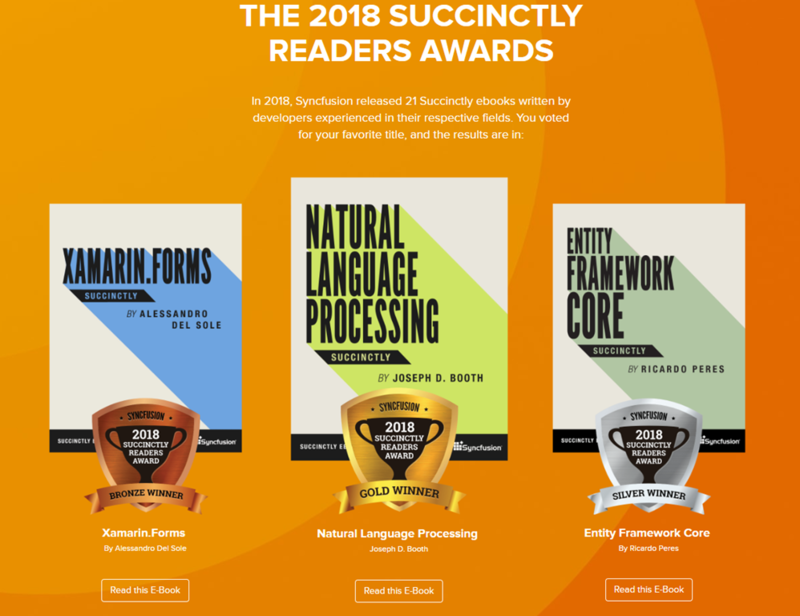 My e-book Entity Framework Core Succinctly was silver winner on the Succinctly Series Readers Awards! Many thanks to all who voted for it! 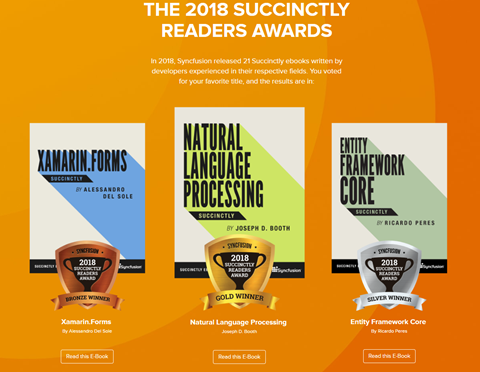 And congratulations to Joseph D. Booth for winning the gold award for his Natural Language Processing Succinctly and to Alessando Del Sole (@progalex) for his bronze award for Xamarin.Forms Succinctly! This post is part of a series on performance in .NET. See the first one on object instantiation and the second on property copying here. This time I’m going to talk about collections, but focusing on the performance side. Back in 2009 (!) I wrote a blog post, which I updated a couple of times, about .NET collection types. Essentially, my point was – is – that you should pick the right collection for the job that you have at hands. This post is still up to date. How many of us don’t by default just choose List<T> when there is need for a general-purpose collection? I certainly do, at times… Well, it turns out that this may or may not be what we need. Let me give a few examples. List<T> is an array-based collection, which means that it is probably the best if you are going to iterate through items one at a time, sequentially, but it is not so good if you want to remove items from a random position other than the list’s end, because this causes a whole new array to be instantiated in memory, and all items (except the one that you wish to remove, of course) from the original list to be copied into the new one. It’s the same problem with random inserts at any given position, other than the end, and only if the initial capacity isn’t exceeded. For operations where random inserts and deletes are required, LinkedList<T> is a much better choice as it does not require the instantiation of new arrays and the memory copy. It does that, however, at the expense of a slightly poorer performance in list traversal. What about duplicates? With the previous list implementations, if we don’t want to allow duplicates, we need to check one by one, which is a PITA. Luckily, the .NET BCL has an implementation of a mathematical set which automatically excludes duplicates. One implementation is HashSet<T>, which is an indexed collection that uses each object’s GetHashCode method to figure out if the object already exists in the collection; needless to say, this method must be properly implemented. Talking about indexed collections, if we want to be able to rapidly get to one element – or a number of elements – by some key, .NET has that as well: Dictionary<TKey, TValue> for storing a single value per unique key. The key can be of whatever type we want. This one also offers good performance when it comes to retrieving, adding, removing or modifying a single item. Then we have LIFO and FIFO implementations in the form of the Stack<T> and Queue<T> types, which are optimized for adding items at the top or the bottom of the list, respectively, and don’t even allow other kinds of operations other than traversal. Internally they also use a linked-list approach. BitVector32 is more efficient than BitArray for Boolean values and small integers that are used internally. A BitArray can grow indefinitely as needed, but it has the memory and performance overhead that a class instance requires. In contrast, a BitVector32 uses only 32 bits. Finally, Microsoft makes available thread-safe collections that are thread-safe in nature and therefore do not need any thread synchronization mechanisms, which makes them faster than if we had to roll out our own thread synchronization. They include thread-safe dictionaries (ConcurrentDictionary<TKey, TValue>), queues (ConcurrentQueue<T>), stacks (ConcurrentStack<T>) and general-purpose lists (BlockingCollection<T>). I didn’t go through all the collection classes available, for that you can refer to my previous post. And, of course, measure your usage so that you can make opinionated decisions. If performance is not an issue, by all means, forget about this and keep on doing what you are already doing and works for you. This is the third in a series of posts about the similarities and differences between C# (and .NET, to some extent) and Java. You can find the first one here and the second one here. Again, with this I do not intent to demonstrate that one is superior to the other – totally – as I really like both platforms, even though I work mostly with C# and .NET. This is merely an exercise to show these differences and maybe it can be useful to someone who is learning one or the other. If you find something that you think is wrong, please let me know! .NET does not offer methods corresponding to notify, notifyAll or wait. On the other hand, Java does not offer a method like ReferenceEquals. You can have as many Deconstruct methods you like, provided their signatures are different. For now, at least, Java is still lacking this functionality. Mind you, only the “final” piece is returned, for example, if you use nameof with a fully qualified type name, you’ll only get the type name. The closest that Java offers is anonymous classes, which are actually pretty cool, IMO. Forgot to say, assertions can be disabled, which means, they are turned into no-ops. I still have a couple of things to talk about, so be prepared for a future post! As always, do let me know if you think I got anything wrong or you wish me to clarify something. In this post I’m going to talk about a few gotchas with the .NET Core’s built-in inversion of control (IoC) / service provider (SP)/dependency injection (DI) library. It is made available as the Microsoft.Extensions.DependencyInjection NuGet package. I wrote another post some time ago, but this one supersedes it, in many ways. GetServices<T>: returns all services registered as the template parameter type, cast appropriately. Why would you want to do that, you may ask? Well, there are service providers out there that offer much more interesting features than Microsoft’s (for example, more lifetimes), and this has a reason: Microsoft kept his simple on purpose. So, what happens when you ask for an implementation for IService? Well, you get the last one registered, in this case, ServiceB. However, you can ask for all the implementations, if you call GetServices<T>. Don’t worry about registration order: IOtherService will only be required once IService is retrieved. You cannot have a Singleton registration depend upon a Scoped service. This makes sense, if you think about it, as a singleton has a much longer lifetime than a scoped service. The CreateScope method comes from the IServiceScopeFactory implementation that is registered automatically by the dependency injection implementation. See next for implications of this. Why is this needed? Because of lifetime dependencies: using this approach you can instantiate a service marked as a singleton that takes as a parameter a scoped one, inside a scope. All services instantiated using the Scoped or Transient lifetimes that implement the IDisposable interface will have their Dispose methods called at the end of the request – or the nested scope (when it is disposed). The root service provider is only disposed with the app itself. The built-in service provider validates the registrations so that a singleton does not depend on a scoped registration. This has the effect of preventing retrieving services in the Configure method, through IApplicationBuilder.ApplicationServices, that are not transient or singletons. As I said before, the other alternative is creating a scope and instantiating your singleton service inside the scope. This will always work. inheritance, but not property, in controllers and Razor Pages. You can achieve that through actions or conventions. Another option is to use the Service Locator pattern. You can retrieve any registered services from HttpContext.RequestServices, so whenever you have a reference to an HttpContext, you’re good. From the Configure method, you can also retrieve services from IApplicationBuilder.ApplicationServices, but not scoped ones (read the previous topics). However, it is generally accepted that you should prefer constructor or parameter injection over the Service Locator approach. You should consider a more featured DI library, and there are many out there, if you need any of these. It seems I’m in the mood for Managed Extensibility Framework: second post in a week about it! This time, I’m going to talk about how we can integrate it with the .NET Core’s service provider/dependency injection (DI) library (Microsoft.Extensions.DependencyInjection). Mind you, this will apply to both ASP.NET Core and .NET Core console apps. Notice how MEF let’s us resolve Lazy<T> instances besides T. This is pretty cool, as we can delay object instantiation to a later stage, when the object is actually needed. A word of caution: the instantiation will actually be done by MEF, not by the .NET Core DI, so you won’t have constructor injection. The concept of middleware has been around since ASP.NET MVC (pre-Core) and OWIN. Essentially, a middleware component lives in a pipeline and handles requests and acts as a chain of responsibility, delegating to any subsequent middleware components registered in the pipeline after itself. The following image (taken from the Microsoft site) shows this. MVC itself is implemented as a middleware component, as is redirection, exception handling, buffering, etc. A middleware component can be added in several ways, but in ASP.NET Core, it all goes down to the Use method in IApplicationBuilder. Lots of API-specific methods rely on it to add their own middleware. For the time being, we’ll make use of the IMiddleware interface that comes with ASP.NET Core. It provides a simple contract that has no dependencies other than the common HTTP abstractions. .NET Core has Managed Extensibility Framework (MEF), and I previously blogged about it. MEF offers an API that can be used to find and instantiate plugins from assemblies, which makes it an interesting candidate for the discovery and instantiation of such middleware components. We’ll use the System.Composition NuGet package. As in my previous post, we’ll iterate through all the assemblies in a given path (normally, the ASP.NET Core’s bin folder) and try to find all implementations of our target interface. After that we’ll register them all to the MEF configuration. The IMiddleware offers an InvokeAsync method that can be called asynchronously and takes the current context and a pointer to the next delegate (or middleware component). We define a convention that for each type found that implements IPlugin we register it as shared, meaning, as a singleton. As you can see, if the path parameter is not supplied, it will default to AppContext.BaseDirectory. We can add to the plugin/middleware implementation an ExportMetadataAttribute with an Order value to specify the order by which our plugins will be loaded, more on this in a moment. If you want to search all assemblies in nested directories, you need to pass SearchOption.AllDirectories as the searchOption parameter, but this, of course, will have a performance penalty if you have a deep directory structure. Notice how we applied an ExportMetadataAttribute to the class with an Order value; this is not needed and if not supplied, it will default to the highest integer (int.MaxValue), which means it will load after all other plugins. These classes need to be public and have a public parameterless constructor. You can retrieve any registered services from the HttpContext’s RequestServices property. And here you have it: ASP.NET Core will find middleware from any assemblies that it can find on the given path. I won’t be talking about object serialization, as there are lots of serializers out there, each with its pros and cons. In general, I’d say either serializing to and from JSON or from a binary format seem to be the most demanded ones, and each has quite a few options, either provided by Microsoft or from third parties. The actual usage also affects what we want – is it a general-purpose serializer or one for a particular usage, that needs classes prepared accordingly? Let’s keep it out of this discussion. As always, feel free to reach out to me if you want to discuss any of these! So, lets start with object creation. Let’s cover them all one by one. This should be the baseline for all performance operations, as it should offer the best possible performance. Just avoid getting the constructor over and over again, do it once for each type then cache it somewhere. Pay attention that none of the constructors of your type are executed, and no fields or properties have their initial values set, other than the default value for each type (null for reference types, the default for value types). As you can see, we are just generating code for a dynamic method, providing a simple content that does “new Xpto()”, and execute it. Of course, if you are to call this a number of times for the same type, it may be worth caching the constructor for each type. Feel free to run your tests, with a few iterations, and look at the results. Always compare with the normal way to create objects, the new operator. Do not forget the problems with each approach, like the need to cache something or any limitations on the instantiated object. As usual, I’d love to hear your thoughts on this! More to come soon!